Up to 1998 car oils had been used as the base for many motorcycle oils. As car technology evolved over the years the oils that cars needed changed and additives were added that weren’t good for motorcycle engines (especially motorbike clutches and gearboxes, mainly due to the fact that, unlike most motorcycles, cars use a separate oil for the gearbox). JASO also introduced a rating system for 2 stroke oils. Modern 2 stroke bike and scooter engines have much finer tolerances and low ash burn (which means less smoke) and need a higher specification 2T oil. JASO FD – This spec is almost the same as the JASO-FC spec but with much higher detergent capabilities. The JASO specifications are the Japanese equivalent to the American API standard and were introduced partly because the API standards used for oils weren’t up to the job for modern engines. Where to find the JASO information on an oil bottle….. 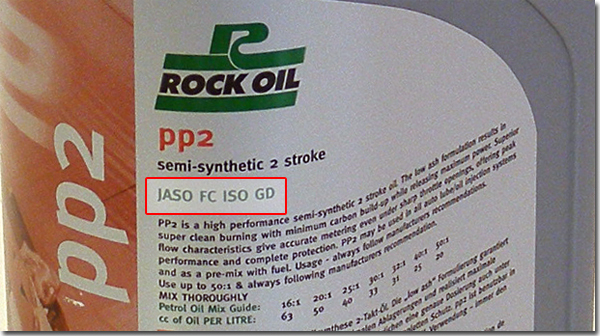 Normally the JASO and other oil specification information will be printed on the back label. A few point’s to consider when selecting a JASO approved oil…..
Engine oil is an amazingly complex subject and (unsurprisingly!) the approvals that are used to rate the oil are complex (and vague!). There are a few point’s to consider before you part with your hard earned cash when buying oil. When buying oil (with only a few exceptions! ), you get what you pay for. So if you are offered 4 litres of ‘fully synthetic’ 10w40 ‘JASO MA2’ approved motorcycle oil for £25, you can bet all your ££ that it WON’T be fully synthetic and would be very unlikely to pass the JASO MA2 test! 2) Cheap/workshop/etc 10w40 oils aren’t suitable for all bikes! Unfortunately, better oil cost’s more money! I bought Repsol 4T sintetico 10W40 for usd 8 @1 liter which state in the label as fully synthetic which meet JASO MA2 -API SJ. is it to good to be true consider the brand name so well known. Which Repsol Sinteico 10w40 oil did you get (I think it comes as semi-synthetic, synthetic or fully synthetic)? The botle color and label exactly identical ,except one said”fully synthetic” under 10W-40 with JASO MA2 and the other not stated the oil type and only meet JASO MA.quite deceiptive I think. Because of that I accidently mixed those oil in my motorcycle. It’s important to note that only JASO MA & MA2 certified motor oils have the JASO box ( on the back of the bottle ) and individual certification number located on the top of the MA or MA2 logo. 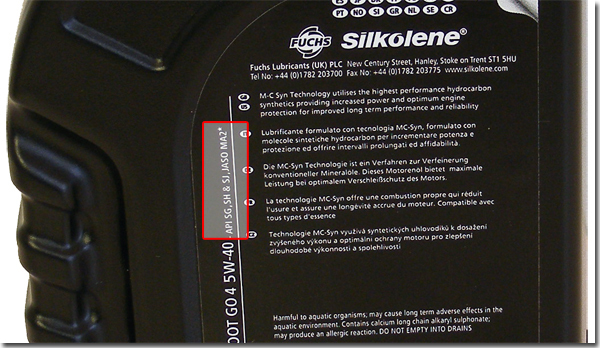 SILKOLENE and ROCK motorcycle oils only state that they ” meet or exceed” JASO MA or MA2 requirements – not tested or certified JASO ( Japanese Automotive Standards Organization ) performance. Yes, if the oil has been tested and passed the relevant JASO spec, it should have a box with the appropriate JASO number on it. Just for your info though, nearly all Silkolene motorcycle oils have the JASO box and relevant number on the back (where the oil needs to be JASO approved). Some higher level Rock Oil motorcycle oils USED to display the JASO box and number on the back (I know Guardian used to have the JASO box). But, as Rock are a fairly small company, they haven’t kept up with getting their oils tested by JASO due to the cost of getting the oil tested once a year (to use a direct quote from Rock Oil: ‘It isn’t mandatory and is very expensive without adding anything meaningful‘). However, Rock Oil do have their own, in house testing facilities to make sure the oil meets the spec and, after a recent email from them, they are in the process of having some of their Guardian Motorcycle, XRP and Synthesis Motorcycle ranges tested and approved. Unfortunately, JASO MA oils may not meet the MA2 standard as, in simple terms, MA2 has higher standards and additional tests to check oil compatibility with catalytic converts. However, an MA2 oil will pass the MA standard as the oil would need to exceed the MA oil standards to become MA2. I’ve checked some of the comparison images on Google you suggested and they verify what I’ve just stated. Depends on which engine or bike it is, 10w40 is usually ok.
Hello. I just got a kawasaki genuine oil witch says on the label and it’s graded 20W50 JASO MA2 API SG. Is this a good oil for my rouser 135ls? I think the Rouser should use a 10w40 oil, 20w50 might be a bit thick (if you use it make sure you warm the bike up thoroughly before riding)? JASO MA2 is a higher/stricter standard and means the oil is safe to use in bikes with catalytic converters in the exhaust. Some good 20w50 oils will pass the JASO MA2 standard (even though they only state JASO MA on the label). You would be better off checking with the bikes manufacturer or an official dealer to make sure. I have a 2012 Kawasaki voyager 1700. Is castrol 4t 10w40 a good oil to put in it. I’ve never used or sold Castrol oil so can’t say if it’s good or not unfortunately. oil jaso ma2 is good for engine with catalytic converter on the exaust. My scooters’ recommended specification in engine oil is JASO MB. My question is, can I use JASO MA/MA2 on my scooter? Thanks! Yes, you can. JASO MA and MA2 are higher spec oils. JASO MA is a higher spec then JASO MB (so a JASO MA oil SHOULD! be better quality). Yes, back in the day there was normally only 1 oil available for both cars and bikes. However, engine technology has moved on alot since then and modern car and bike engines are machined to much finer tolerances (hence the need to add additives to the oils that weren’t available in the 1970’s). Modern oils are (generally!) much better quality now compared to the older counterparts, mainly due to better blending processes and additives that are available. Modern oils are more expensive, yes, but part of the price is due to inflation (nothing stays at 65 cents forever!). Also, the actual cost of the oil has very little bearing on the price of modern oils, most of the cost of the oil is made up of processing, additive and packaging costs (which is why retail oil prices tend to stay the same whether oil is going up or down in price). As to the the same oil being used in both cars and bikes (as happened in the 1970’s and 80’s), modern engines need additives to keep the metal parts running correctly and not all these additives are suitable for all engine types (which is the main reason we have different car, bike, truck etc oils now). In short, modern oils are more expensive by comparison, yes, but they are much better quality…..
sir my bike is wind 125 and riding it for almost 12 yrs now. can i use castrol 10w-40 4t api sl jaso ma2 ? i used the api sg jaso ma 20w-40. It should be ok to use a 10w40. You might want to check in your handbook or with a dealer though as it may depend on the temperatures where you are? I think you are wrong telling scooter owners to use JASO MA oils when JASO MB has been specified by the manufacturer. Most scooters are dry clutch and thats what the different rating is about clutch slippage. Most cruisers/sportsbikes/tourer bikes use the same oil for engine and gearbox. Others like Harley,s have seperate engine and gearbox oils. A JASO MA oil is a higher spec then a JASO MB oil, which means it should be a better quality oil. Although, unlike JASO MB oils, JASO MA oils have clutch tests as part of the testing there are many other areas that are tested (including lubricity, detergents etc etc), this means that a JASO MA oil has to pass a higher standard then a JASO MB oil, effectively meaning it should be a better oil as it has passed a higher specification. JASO MA1 is a slightly lower grade oil. Not seen any bikes where the manufacturer recommends a JASO MA1 oil to be honest? Hi, I have just obtained a Peugeot 50cc 2 stroke motorcycle with added ‘big bore kit’ and ‘advanced ignition’. The Haynes manual states “JASO FC, SAE 20 semi-synthetic” is the appropriate 2 stock oil, could you tell me if that is still sufficient, bearing in mind the changes that have been made? The closest that I could get at my local service station was ‘Q8 Scooter Daily Super JASO FC, API TC ++, TISI 1040’ (I am assuming the TISI 1040 is the same as 10w-40?). It says “Daily Super – Advanced Performance – Synthetic Based – 2T Motor Oil” on the bottle. If you running a performance/modified engine you should use a good quality, fully synthetic 2 stroke oil. If your unsure what to use, ask your local motorbike shop what they recommend as they should have good knowledge about oils and stock a good quality 2 stroke oil. If the oil meets or exceeds the specs needed for the bike (the oil specs are normally on the back of the bottle) it should be fine. Its tiring to explain to people that jaso ma2 is best for your bike & scooter. Just as tiring to convince that fully synthetics are best. Regular & part syn are scams. You agree? No, mineral and semi synthetic oils are NOT scams or ‘bad’ oils (depending on the manufacturer!)….. They have there uses, and they are fine when used in the correct engines, the problems come when people try to cut costs by using mineral oils in engines that need a fully synthetic oil! I haVe a suzuki address scooter 2016. I have been using semi sin oil jaso mb rated because the manual said so. But every time ride it the first 30min was.good but any longer it starts becoming lethargically slow unspirited ride because of overheating. I am guessing it needs fully sin oil .will there be any side effects if i use jaso ma2 fully sin oil on my suzuki? Since this oil do not have friction modifiers that dry clutch scooters need for fuel efficiency. What are your recommendations? If your bike is getting that hot that it is slowing down it may not be the oil that’s causing the problems? A better oil (like a fully synthetic) will protect your engine better, but you may need to allow time for the engine to cool down a bit if it’s overheating too much. The recommendations in the handbook are the minimum specs required, you can use a better oil (like a JASO MA2 oil). Prior to this i did use various oils from various labels there were noticeable differences in ride quality. I know scooters and air cooled bikes need fully synthetics. Just when it comes to scooters they mention always molybdenum disulfite as a key substance to scooter fuel economy. it had confused me greatly. But maxi scooters require jaso ma , so you were right about the oil standards. Jaso mb is not a different kind of oil its just A lower grade oil with lower performance for less demanding invironment. (do tell if i am wrong). I also found out that the oil filter was warped out. it was a counterfeit part. After swap to new originals the bike improved dramatically smoothe spirited ride has been restored.again you were right about the oil not being the culprit. You are very skilfull mechanic, i commend you highly! Thanks. A fully synthetic oil is better for scooters as it’s able to cope with heat better (basically it doesn’t break down when hot as easily as mineral and semi synth oils). Because most scooters are wrapped in fairings, they can run a bit hot. I’ve used Hiflo filters and the quality is good, so would recommend them. Steel covered filters aren’t always the best option as the steel can limit the flow of oil through the filter? I have a old Enfield (BULLET) 350cc which is 1977 model . Recently i have modified it to 4 clutch(older was 3 clutch). I want to know from you which oil is best engine oil for it and which clutch oil should i use for best performance and best protection of it’s engine and clutch . Currently i am using Castrol 20w50 . should i use full synthetic oil or JASO MA2 oil . What kind of oil filtration system does the bike have? Are you sure the oil is causing the overheating problems? Better oils (like fully synthetic oils) are better at coping with heat, they shouldn’t really cause a bike to run hotter or cooler? Although oils can help to transfer heat away from the engine (and can help to cool the engine if an oil cooler or similar is used). It’s very unlikely your problem will be fixed by using a thicker oil. You’ll more then likely find that the oil will be thicker on start up and may not circulate round the engine properly. How is your bike cooled (e.g. air/ water/ oil cooled) and what’s the mileage on your bike? Its air cooled, fan assisted scooter engine. Just bought it, about 8 thousand km. I understand that there maybe many possible cause, maybe even new oil just getting in “brake in” period because this is the first time im using fully synthetic jaso ma2. Idont believe heavy viscosity oil flows badly. Its recommended for hot climate with air cooled motors.i had some bad advice before and used 10w30 in hot season and the top engine just seized! You were right again about the heat issues. I. Recommended a friend who is also a fellow scooter rider to try premium unleaded fuel togather with fully synthetic oil jaso ma2 motorcycle oil. The results were so much more better ride quality, and almost eliminated the heat problems. The fuel was directly the cause of the heat and vibration. Thanks for educating me about better oils. Cheers mate! Right now past 500 km, its riding better now. Smoother . Maybe its just the new oil & filter adjusting in. I”ll keep you updated. White dog dude , you there? I must ask you about these oils jaso mb and jaso ma\ma2. Why do oil companies like motul continue to make jaso mb oils when we know its a low grade low performing oil? Even maxi scooters use jaso ma/ma2. Please do tell your thoughts on this. Why do they make Jaso MB oils? Cost and profit! Some bikes and markets (countries) only need a Jaso MB spec oil, it adds alot to the cost of the oil to get it JASO MA/MA2 approved so oil blenders only do it if it’s really necessary. And don’t just assume that ma2 is better than ma-1 they’re just just meet coefficients of friction standards which implies at what point your clutch will slip many people assume since you made two came out later that it’s better it’s just a little bit different. I dont get it ? It could be so much easier to just formulate oils with jaso ma/ma2 specs. You can sell it to every motorcycle rider &scooterist and avoid the mishap of using mb oils in motorcycles with clutches. Even maxi scooters use jaso ma/2 oils. I know a guy who uses car engine oils in his motorcycle. Cant. Convince him to switch to 4t oils until its too late. To be honest you would be better off speaking to the oil blenders as to there reasons why they make JASO MB oils. White dog dude, i have a question. My oil pan dip stick is giving a confusing reading oil level. On one side of the stick its all full and the other side it reads half. Read your bikes handbook. The handbook’s normally say make sure the bike is on the center stand and on an even, flat and level piece of ground (you’ll get different readings if the bike is pointing up/down hill or leaning to one side on a hill). It on middle stand and level. But how do i dip the stick? Do i dip the stick , the lattice pattern tip up/down or side to side? Clean the dip stick, then put it in the hole and screw it in place, when you remove it again it will show you the oil level. The hand book says not to screw it in. Can you tell me why i should screw it in? Anyway i “ll do it. The thing is , whenever i check the oil level, one side of tip reads halF and the otherside reads full. What shall i do? Do what the handbook says. As long as the oil is above the minimum mark it should be fine. I have a question. My scooter makes a ticking noise recently. A friend told me that im using the wrong oil weight on my air cooled engine because here the climate is hot year around. He continues on and says that 10w40 oils will fail in this invironment and cause engine damage because its too thin .he urges me to change the oil “ASAP” to 15w40 or thicker. Whats your opinion on this? The handbook says to use 10w40 but it also tells the owner to use the oil visc chart to choose the suitable oil. I wouldn’t personally use a thicker oil, you may want to try a 10w50 oil which is better at coping with hotter temperatures. A 15w40 won’t be any thicker then a 10w40 when it’s hot, only when it’s cooler (the 15w part of the oil code means it will be thicker when cold, but as both oils are ’40’ rated in the 2nd half of the code, they’ll be the same thickness when hot). Thicker oil when the engine is cold isn’t always a good idea, especially in small engines with tiny oil pathways! I agree with you. but i told him ( that dude) the exact same thing, whats the difference between 10w40 and15w40? He says the base oils. The wider the visc range, the more additives used and when the miles add up and the additives gets used whats left is base oils. The base oil that lubes the engine, and since the additives are worn out the base oil unable to remain a 40 weight. Thats when damage happens. Can you verify or dispute his claims? That’s possibly partly true, some additives (like detergents) may get used up. However, how long the additives used to make the oil a 10w40 or 15w40 will last is more dependent on the quality of the oil, additives and blending process. Also, there is actually very little difference between the thickness of a 10w40 and 15w40 oil….. So ,shall i follow that dude”s advice or just leave it be? Because it only ticks at the heat of the day. The bloke went to some efforts to even show me some of his work trip study in EU on automotive oils that effect engines. He showed the damage done by 10w40 “all season” oils , when 10w30 was the suitable weigh(cold weather this time). He was responding to my argument about it being the same weight. He says that when you get the visc wrong, the engine is finished! I just nodded at him. if i use a 10w50 it might help just like you recommended but it will degrade faster than a 15w40 or 15w50 under hot conditions. You might be better seeing what the handbook recommends for contacting the manufacturer or a main dealer directly. They may be able to offer specific advice for your country and climate? I am sorry if i ask too much of you ,mate. The place i live at has zero after sales support, so im on my own to deteRmine what i put in my motorcycle or scoot. A 10w50 should be ok, it’s a better oil for bikes that don’t hold much oil and is able to withstand higher temperatures. Most oil companies have technical departments you can email that may be able to help you if your still having trouble? Ok. Cheers bro, will do. I”ll keep you updated with my situation. I am about to do my first oil change on my Honda crf150f and wanted to make sure I am putting the right oil in it. I am going crazy trying to find a oil that has all this information printed on the bottle. Any advise that you can give would be greatly appreciated. THANKS!!! Yep, the specs can be a bit confusing! Any semi or fully synthetic 10w40 motorcycle oil will be fine. Most of the specs (no non detergent, castor, vegetable etc) only apply to very old fashioned, single grade oils (like SAE 40 oils), mulitgrade oils (like 10w40) won’t have those in. 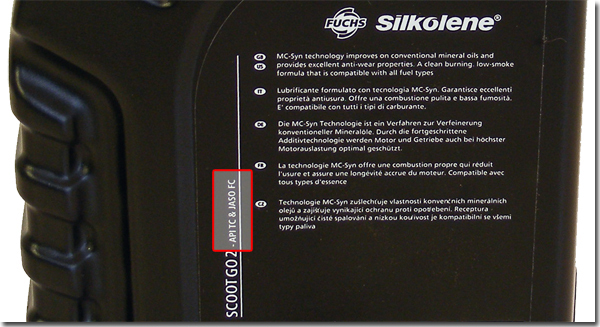 Hi, am using Motul 10w40 on my Suzuki ts185, in the manual it says to use a good quality SAE 10w-40 multigrade moto oil. By the way, am from Mauritius, winter: 20 -24 deg C and summer: 27-32 deg C.
The oil should be fine if it’s a motorcycle oil. Hi I live in greece where temp/s here are too high . My bike is a BMW F650 97 ‘ . Sould i use 10w50 oil & if you have any proposal for me. An other thing is that BMW dont recomment SJ oils … should i take them seriously ??? Yes, a fully synthetic 10w50 motorcycle oil would be good if the weather is hot where you are. You shouldn’t use SJ or lower rated oils in your bike. I have a 1997 Honda cb500 unmodified with 20k on the clock. I use the recommended 10w 40 oil for it but have a stock of CASTROL POWER1 RACING 4T 10w-40 oil. Would it be OK to use this in the bike. Just wondered if it will be ok particularly for the clutch. Using an MA rated oil instead of an MA2 rated is unlikely to noticeably effect the performance, but MA2 oils are developed to work with catalytic converters so personally, I would stick with a JASO MA2 oil if your bike has a catalytic converter. The SUZUKI BURGMAN 400 k7 2007 has been exceeded 60,000 km. By now I used the Motul 5100 10w40 oil. And now I’m thinking what to pour Motul 7100 10w50 or Motul scooter expert 4t 10w40ma. And you were kind enough to write me your opinion between these two oils for my engine. Thank you very much. I haven’t got any experience with Motul oils as I never used them and we’ve never sold them. If you live in a very hot country you might want to use the 10w50 oil as it should be better at coping with hotter temperatures? Dirty oil won’t damage the motor, but it’s unlikely to protect the engine as well as fresh/clean oil. Erm…. I’m not sure I understand your question? I would imagine they probably used a semi synthetic 15w50. Although not ideal, it wouldn’t be a problem for the engine if you put a bit of a different grade of oil in. I have a 1991 Honda CBR1000FM (no catalytic converter) on which I intend to do an oil change. I’ve read plenty on this site and I’m now trying to nail what I should be looking for. In particular, I’ve been told/read JASO-MA is the main thing to concentrate on and understand the difference between it and MA2 is the suitability for catalytic converters (which doesn’t apply in my case) but wouldn’t harm my own bike. The service manual merely states 10W40 or 20W50 no mention of mineral, semi-synth, full synth etc but I’d like to know whether I should adopt mineral/semi/full synth as I’ve heard fully synth oils can cause problems with clutch slippage. Finally, I’ve also read on some respected network/forums that oils for diesel engines are also good for older motorbikes like mine……Any view on that too? Many thanks for a helpful site. Back in 1991 there was alot less choice of oil for bikes and alot or the bike oils on the market were derived from car oils (manufacturers don’t very often make oils from scratch, they take an already existing oil in their range and change it to suit). Will a JASO MA2 oil harm your bike? No, as well as part of the JASO MA2 standard being regarding catalytic converters in modern bikes, it is generally a much higher standard then JASO MA so is a JASO MA2 oil is a better bike oil. The service manual merely states 10W40 or 20W50 no mention of mineral, semi-synth, full synth etc? You can use any grade oil (mineral, semi or full) in a 1991 CBR1000. A fully synthetic oil is the best option and will mean you get no noticeable engine wear. However, proper fully synthetic is expensive so I would personally recommend a good semi synthetic which has a good balance between price and engine protection. I would recommend a 10w40 oil for the CBR1000 and if your after a good oil that will help clean the engine, search for Rock Oil Motorcycle Guardian 10w40. I’ve also read on some respected network/forums that oils for diesel engines are also good for older motorbikes like mine? Diesel engine oils contain alot of detergents, mainly due to diesel being a very ‘dirty’ fuel, this can be good for older engines to help clean them out…..BUT, modern car oils contain ‘friction modifiers’, which have many benefits for cars which use a separate gearbox and gearbox oil. Friction modifiers are not good for bike engines as they can cause pitting in the gearbox and clutch slip. I’ve heard fully synth oils can cause problems with clutch slippage? A proper fully synthetic bike oil won’t contain any additives that make the clutch slip. However, no name supposedly ‘full synth’ (ha ha ha!!) oils are sometimes derived from car oils, which contain friction modifiers which can make the clutch slip. Basically, if you want a good oil go for a semi synthetic motorcycle 10w40 from a well known manufacturer (Castrol, Mobil, Rock Oil, Silkolene etc). Interesting information, however the examples provided in the pictures are not JASO approved motor oils. The JASO label will contain a rectangle which includes the oil manufacturers certification and either of the following letters MA or MA1 or MA 1 or MB (MB being the least of the crowd). There are many lubricant manufacturers who proclaim their products to meet or exceed JASO requirements however there are those who prove their claim by seeking and obtaining certification/compliance and therefore the ability to indicate the proper JASO certification label on their products. If a lubricant manufacturer is unwilling to seek proper certification, then I would question (highly) their clams that their lubricants conform to JASO requirements. Remember this… If the vehicle manufacturer requires the use of JASO compliant oils in your motorcycle, then one need make sure the oil they are purchasing bears a proper JASO certification label, else the manufacturer is not responsible for engine, transmission warranty should failure occur without JASO certified oils. I have a European maxi scooter honda SH300. The owner manual recommend jaso MB 10w-30. But I am living in the middle East which is really hot weather most of the year with average temperatures 30C up to 44C . Which oil type would you recommend? I would double check with your Honda dealer or check your bikes handbook (there’s normally a section about different oil grades for hotter climates), but, you could use a good quality, fully synthetic 10w50 oil (it would be better at higher temps and fully synthetic oils are better at coping with heat). Hi, i have a 2017 Honda VFR1200X Crosstourer, manual transmission. Owners manual says 10W/30 API SG or higher, JASO T 903 MA standard. Question is……this oil seems too thin as we often have higher ambient temperatures over 30 degrees in the UK. I would prefer to use a 10W/40 instead. Can you see any issue doing this? Honda seems to be the only big manufacturer speccing 10W/30 across its range and the only thing i can find is they say its to do with economy and emissions? I would rather have a more protective and slightly thicker oil TBH. Would appreciate your advice.